If you love coffee you may have heard of Kona coffee. Considered one of the best gourmet coffees in the world, Hawaiian Kona coffee is a smooth, rich, complex and deeply aromatic coffee. If you have never tried these gourmet coffee beans, you are in for a treat! Here we share some of the best Kona coffee brands and how to make sure you are purchasing pure 100% Kona coffee. Why are Kona Brands So Special? What Does Kona Taste Like? 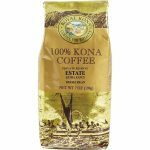 Are You Buying Real Kona Coffee? What is the best Kona coffee? 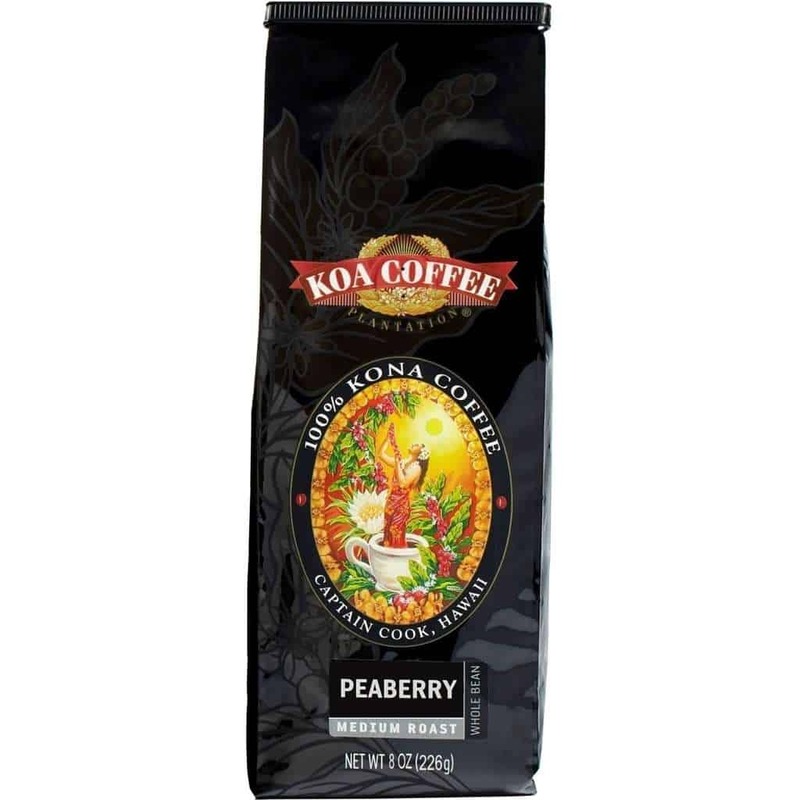 This exclusive Koa peaberry coffee is one of the best kona coffee brands. Shipped direct from the farm, be warned you may not be able to go back once you try these beans! Click to review the price and options. We have shortlisted the best 100% pure kona coffee bean brands for you here. In our Hawaiian kona coffee review section below we discuss the features in more detail. Kona beans are highly prized arabica coffee beans grown on the slopes of two volcanoes in the Gold Belt of the Kona District on Big Island, Hawaii. 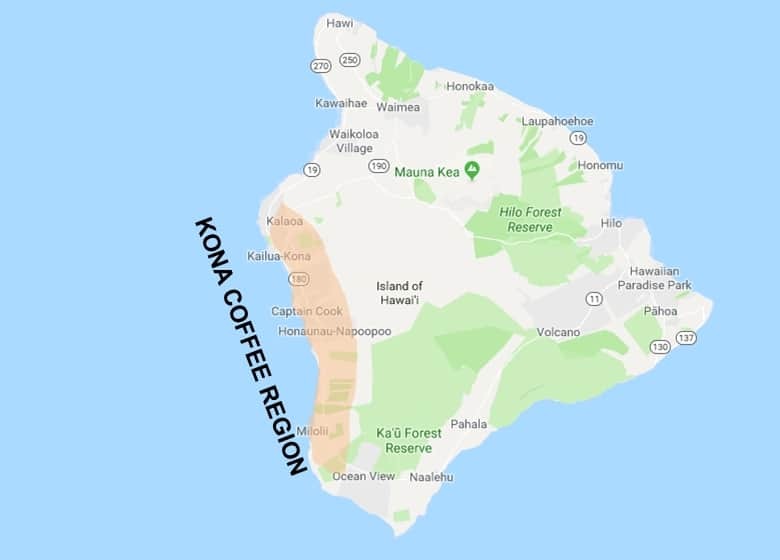 Just 30 miles long by 2-3 miles wide, the famous coffee belt includes both North and South Kona on the west coast of Big Island. Gourmet kona coffee beans are perfect for your french press, chemex or drip coffee makers as well as espresso. There are also one of the most expensive coffee types in the world. Coffee production is only successful in a limited number of regions around the world. Coffee plants need the right combination of sun, rain and quality soil to produce great tasting coffee. Nutrient rich volcanic soil on the slopes of Hualalai and Mauna Loa volcanoes. Well drained slopes for ideal coffee growing conditions. The perfect island microclimate of warm sunny days, humid wet afternoons and mild overnight temperatures. Few coffee growing regions in the world can tick all these boxes and this is what makes Hawaiian Kona espresso beans so special. Plus, when you combine these climatic factors with strict quality controls, hand cultivation and generations of family run business experience, the result is world famous quality coffee. Kona is renowned as being a highly aromatic, smooth, rich, sweet and medium bodied coffee. The flavor notes will vary by farm, but many describe their roasts having flavors such as citrus, honey, caramel and chocolate. The aftertaste is often nutty without the bitterness found in many coffee roasts. It is also considered a low-acidity coffee, which is great for digestion. The Kona region only has ~800 coffee farms, most on small acreages. Coffee is hand picked in small batches at peak ripeness during the year. Labor costs are higher on Kona coffee farms. Total yield is low due to the small number of farms and slow maturation period. The combined result of a superior quality coffee in low quantities and high demand is a high price. 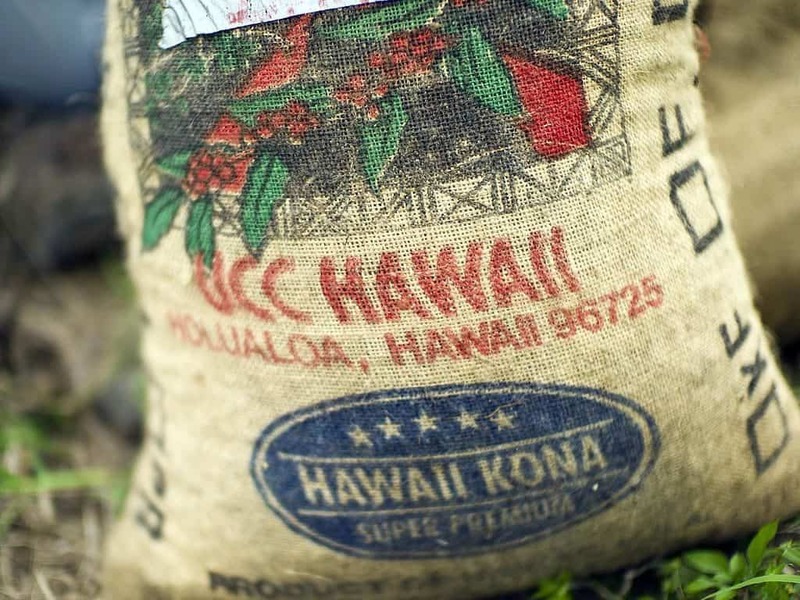 The State of Hawaii Department of Agriculture overseas strict standards to grade Kona beans. We summarise the grades here to help you choose between the different the brands. There are two types of coffee bean. Type 1 is your typical double coffee bean. It contains 2 beans per cherry. Whilst all of the top 5 grades will produce a quality coffee, the best rated kona coffee is the Extra Fancy Kona coffee. Kona extra fancy beans are the ultimate in quality and will cost more than the other grades. Kona coffee peaberry beans are the champagne of the Hawaiian coffee world and naturally command the highest price. Peaberry coffee beans have a higher moisture content, less defects and produce a smooth, full bodied coffee considered to be one of the best tasting coffees in the world. Due to the premium price and value placed on Kona coffee, you need to be wary as there are many Kona blend coffee brands out there. Many Hawaiian coffee brands are not 100% pure kona coffee. A Kona blend coffee needs to include just 10% Kona coffee beans. They are often priced higher than other great espresso beans like these ones but a blend is not 100% Kona and it will have a different flavor to the real deal. It is often difficult to tell at first glance when you buy kona coffee beans whether it is genuine Kona coffee, or a Kona coffee blend. Labelling: Genuine Kona will be labelled as 100% pure Kona. Coffee blends will not. In fact they often avoid mentioning it at all. District: Confirm it is grown in the Kona Hawaii district. State: Check the coffee is Hawaiian coffee. Many companies will name their foreign coffee as Kona or Hawaiian coffee to trick the unknowing consumer. Grade: Expect to pay a premium for Peaberry and Extra Fancy Kona coffee beans. If you are looking for the top rated Kona coffee beans, the grade will usually be listed on the packaging. So how do you choose between the different brands? It is worth noting that just because coffee is grown in the Kona region, doesn’t automatically mean it will taste great. Differences in the quality of the soil, growing and production techniques as well as roasting methods produce distinctly different coffees. To help you choose the best Hawaiian Kona coffee beans, we have reviewed some of the top rated beans here. 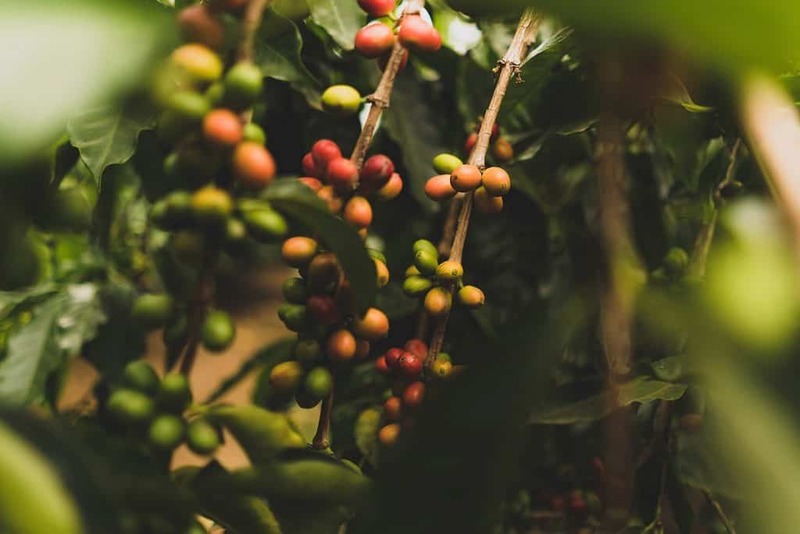 Choose from this list and you can be confident you are buying pure kona coffee. All of the coffee beans we review here are 100% Kona whole bean coffee. 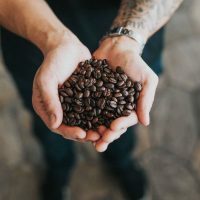 Some companies do sell ground coffee, but honestly, if you are paying top dollar for pure Kona, you need to grind those beans at home to achieve the best tasting coffee. Hawaii Coffee Company is the largest Kona coffee maker in the world and one of the best Hawaiian coffee brand choices. With a number of brands under their banner, the Royal Kona Private Reserve Estate is our top rated Kona coffee. 100% Kona coffee, Extra Fancy Grade and hand-picked from a single estate, it has a distinct aroma and smooth finish. 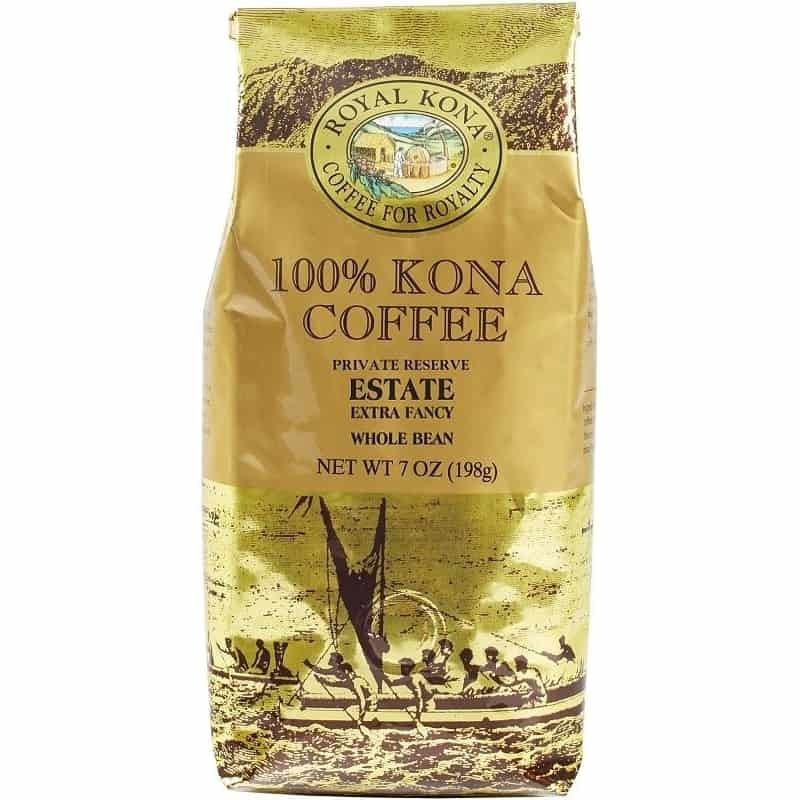 Royal Kona coffee is medium roast but has a light, clean, lively taste unlike some other Kona roasts. It is great for any style of coffee, but if you love to make black coffee in your Aeropress or Chemex, this is a great choice. Where to buy Royal Kona? Hawaii Coffee Company sell Royal Kona coffee whole beans direct from the farm. >> Click here to check the price and order direct. KOA Coffee company was founded in 1997 and has rapidly established itself as a leading Kona brand. Koa Kona coffee have a range of awards under their belt including Forbes best Kona coffee in America. They are renowned as one of the best hawaiian coffee brands and they produce some of the best pure kona coffee roasts. 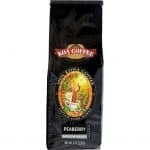 This medium roast has a smooth, well balanced, crisp flavor and a sweetness often seen in Peaberry coffee. 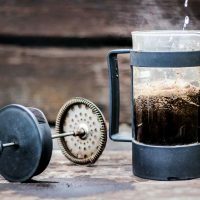 It is perfect for your french press or cold brew coffee maker and is a great choice for black coffee drinkers. 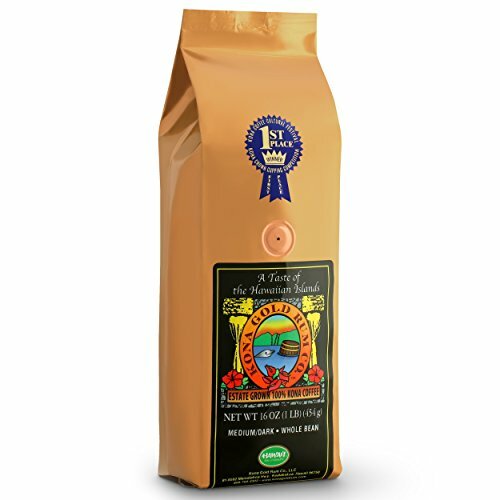 The ultimate in luxury, this gourmet coffee is one of the best Kona peaberry coffee options and makes a great gift for the coffee lover. Koa Peaberry coffee demand often outstrips supply. The best place to buy Koa Coffee is direct from the farm. It isn’t cheap, but it is worth trying at least once, so you should grab a bag when it is available. >> Click here to check the prices and order direct today! This medium dark coffee by Kona Gold Rum Company was awarded first place in the Kona Crown Competition Division at the Kona Coffee Cupping Competition in 2016. Hand picked, sun dried and air roasted, these pure Kona coffee beans are the highest Extra Fancy grade and are a top rated Kona coffee. The taste is smooth, highly aromatic with crisp fruity flavor and tones of molasses and brown sugar. It is low in acid and makes a superb cup of coffee. Many Kona coffee roasts are on the lighter side, so this medium dark roast is a great choice for espresso machines or an auto drip coffee maker. >> Click here to read more reviews and check the price. Hualalai Estate Coffee source the best Peaberry coffee beans from farms across the Kona region to produce a consistent quality coffee every time. Promoted as pesticide free (although not certified organic) this medium dark roast has a full bodied taste and a more robust flavor than other companies on this list. 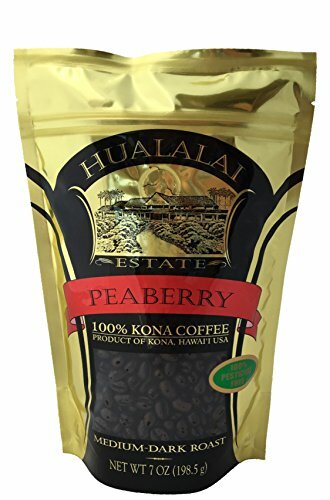 If you love strong coffee then the Hualalai peaberry kona coffee is a great choice. 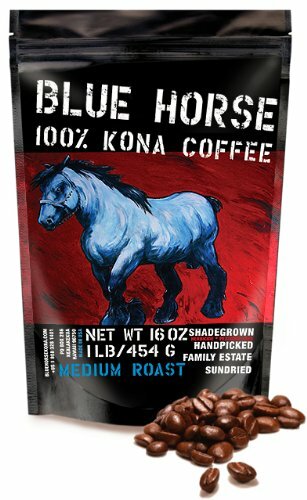 Blue Horse Kona coffee beans are a mellow medium roast 100 percent Kona coffee. It is naturally low in acidity with spicy afternotes. Blue Horse has a lighter flavor so is best for french press, cold brew or chemex coffee drinkers. For espresso drinkers we recommend the dark roast. When you buy online, Amazon manage delivery with priority UPS shipping. Delivery is direct from Hawaii and takes only 2-3 days! 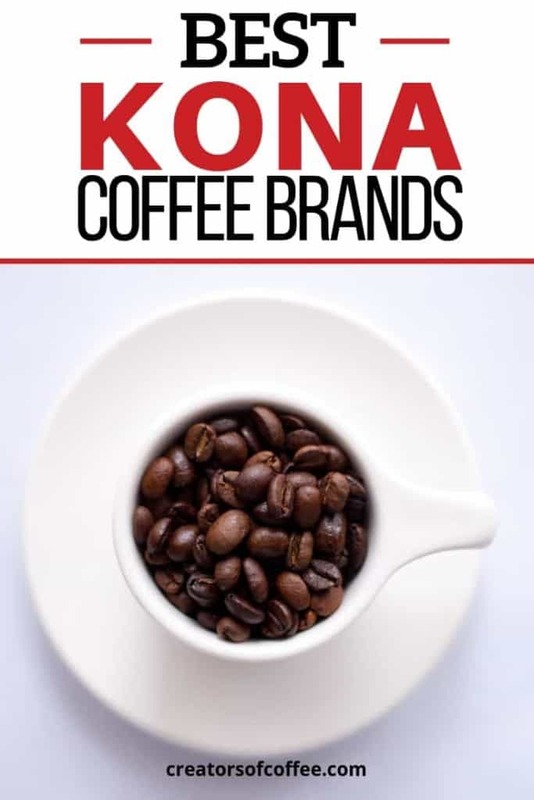 Kona beans are more difficult to find that your everyday coffee beans but the good news is you can buy many kona brands online (although it is also a great excuse for a Hawaiian vacation!). For some Kona coffee brands including our favorites, Koa Coffee and Hawaii Coffee Company you need to order direct from the farm. This is the best place to buy kona coffee for guaranteed freshnesss. 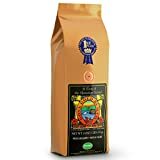 On Amazon kona coffee brands include Blue Horse and Kona Gold Rum Co. We recommend you purchase from the producer through Amazon where possible to ensure maximum freshness. And of course be wary of the blends when you are browsing through options. 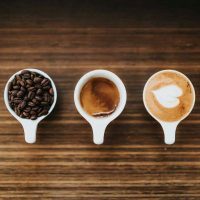 If you are looking for a special Hawaiian coffee gift for a coffee lover, then BeanBox have a Hawaiian Coffee Sampler Box with 4 different coffees to try. Click here to check the price for the BeanBox Sampler Box. The easiest way to ensure you never run out of genuine Kona coffee beans is to order online through Amazon Prime. Just order your weekly groceries online, include a bag of your favorite Kona coffee beans and choose the best same or next day delivery window. What could be easier? Whichever way you decide to purchase your coffee we hope you enjoy this special gourmet coffee. But be warned, it may be hard to go back once you have tried one of the best coffees in the world!